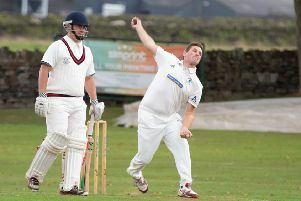 RASTRICK Cricket Club’s first XI have just celebrated their most successful campaign since the 1960’s and in his first season as captain Oliver Pearson could not be prouder. “It is certainly my biggest achievement to date and for the first team it is their first piece of silverware since the middle of the 1960’s,” he said. “It has been a long time coming and just the boost the club needed. Laurence Pearson has now retired from cricket and has turned his hand to refereeing rugby union games as well as coaching a ladies team in Halifax. “I have been told that he is not that bad at it either,” quipped Oliver. Rastrick CC has been like a second home to Oliver, playing up at Round Hill since he was four-years-old, and along with it being a family affair there has been some good friendships made and camaraderie along the way, which he believes has culminated in 2015 being his best year to date. “We are really hoping that we can retain the same team for next season,” continued Pearson. “We started off on a good run, had a bit of a blip mid-season and then finished strongly. “There is some real talent in the side and we would like to keep as many as possible. “Our overseas player Mitch McCoach, who is only 19-years-old, did a sterling job and we are looking at a decent deal for him for next year. “He has gone back home to Australia and has settled in a job, so naturally it has got to be the right move for him to come back. “When Jacob Waterson went to play in Oz he stayed with Mitch, and so this season Jacob naturally reciprocated. “This time, if he comes back we would like to be able to offer him his own home to stay in. “We will need to look at strengthening the side in some areas as we have lost Oliver Ashford back to Bradford League side Pudsey St Lawrence. “We are speaking to people but there is nothing concrete at the moment. “Hopefully by January when we start training down at the Cricket Asylum in Sowerby Bridge we will know what our squad is for next season. To cap off a brilliant year for Oliver he was also awarded the club’s Jonathan Thompson Rose Bowl for Outstanding Services to Cricket.